I kept the black base and the watercolor paper, of course, but changed the rest of the colors. I also changed stamp sets, and the outside nestie embossed square. I only have two masked butterflies instead of three and the butterfly trail flows a little differently! Thanks Roxie for a beautiful inspiration! Thanks for making the time to visit today! Happy Sunday! I really love the Saturday Inspiration challenges over at SCS! Thanks Stef! Well, I used this cover for my inspiration-http://www.splitcoaststampers.com/forums/attachment.php?attachmentid=148162&d=1243651513 I inked up an embossing folder before embossing the outside edges of the frame. I sponged bashful blue onto white and then stamped the little friends. Then, on the main image layer, I stamped the tree, masked and sponged the grass and sky with clouds. I added the sentiment, butterflies, rhinestones, and threaded button to finish the card! Thanks so much for coming to visit! Have a great night! Midnight Madness Meets Limited Supplies! Hi everyone! I made this card for the LSC222 on SCS and for the Midnight Madness Sketch challenge! We were to use only designer paper for all layers except for the card base and to try to keep the embellishments simple! Not so sure I limited myself enough but it's late and I am not trying it again! The butterflies and swirls are designer paper. The swirls are a Cuttlebug die cut that I cut up and rearranged. I did the regular scallops with a corner rounder. I used a vanilla Hodge Podge Hardware ribbon slide and some pearls on the butterflies. I do like this pink! It's so pretty! Well, I really need to go to bed so, thanks for taking a look and have a great weekend everyone! Kelley! I got my order today! Woohoo!!! And can I just say I love Flower Soft! Our Daily Bread designs sells Flower Soft in individual jars and in sets! I bought a set so that I could have a variety and I am so glad I did! For this card, I first colored the image from one of ODBD's June release sets called Ask, Seek, Knock with copics (E37, E49, W5, and W7) and then I cut it out. I used the Flower Soft glue to adhere the teeney tiny little flowers from the Sweet Pea jar. I also cut the cuttlebugged corner embellishments and very carefully attached them to look like a vine. The gray layer is embossed and pierced with an Ornare piercing template (also from the ODBD store and in my order today-YAY!). I pierced the coral strip too and used SU! 's eyelet punch. I used Spellbinders nestie ovals for the sentiment, which is only part of the actual sentiment stamp. I added pretty butterflies and pearls to finish the card! Thanks for taking a look! I appreciate your visit! I'm back! I stayed away from my computer long enough to make this card (and do some yucky chores)! 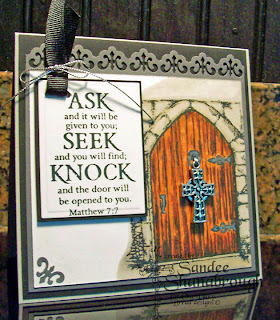 This scripture is from a new June release from Our Daily Bread designs called Ask, Seek, Knock. I used this month's Dirty Dozen sketch at Splitcoast. Become a fan club member to be a part of the special goings on with the Dirty Dozen! Anyway, I also used this week's color combo, Bashful Blue, So Saffron and Pumpkin Pie. I sponged the pumpkin layer with bashful blue to mute it just a little! I cut the squares and ovals with nesties dies and the corner embellishments are cuttlebug diecuts. I colored the flowers with copic marker B21, which is a great match to bashful blue! 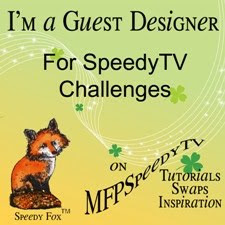 I added the saffron buttons to qualify for today's Ways to Use It challenge to use buttons on our projects, too! I also added pearls, just because! Thanks for taking a moment with me today! I have received such a wonderful award from my friend Judy! This means so much to me! I love the Lord and He has given me so many blessings! The Exalting Christ Blog Award" is given to bloggers who consistently exalt the name of Christ on their blogs. What a joy to see crafters blend their passion for Christ and paper crafting. This award is given to bloggers who share Christ through their posts or through the design of their artwork. We are commanded in Scripture to be 'salt and light' sharing the Good News of Jesus no matter where we are (Matthew 5:13-16). This award is just a way members of Women to Women: Sharing Jesus can say thanks for exalting Christ with us! 1. Name five people to whom you want to offer this award and link to their blogs. The blogs need to obviously exalt Christ in some manner. 2. Contact the bloggers you have named to let them know they can pick up their blog award from you. 3. Invite them to permanently display the WTW blog badge and/or the award on their blogs. The badge can be obtained on the WTW site." Angella for always giving me the most wonderful comments and encouragement! Robbie for writing me the sweetest note after she read my bio on ODBD! Kathy J for showing her love for the Lord in all she does! Tosha whose God given talents are evident! And from Kim! WOW! What a great day! 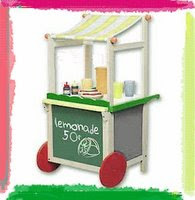 She has given me the Lemonade Stand award since she says I show great attitude and gratitude and my new blog needs an award! Thank you Kim!!! 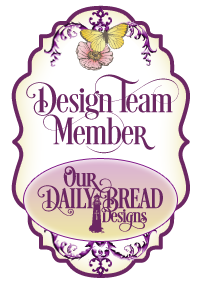 Judy, Robbie, Lorelie, Kathy J, and to Kelley of Our Daily Bread designs. Hope everyone has a great day today! I'll be posting another card today as soon as I can get off this computer and play! 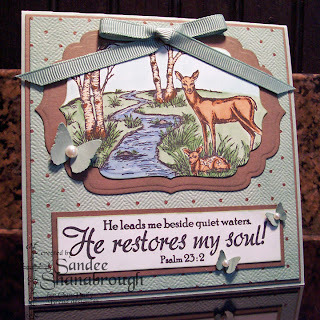 I absolutely love this new release called Quiet Waters from Our Daily Bread designs! Such a peaceful scene and so fun to color! 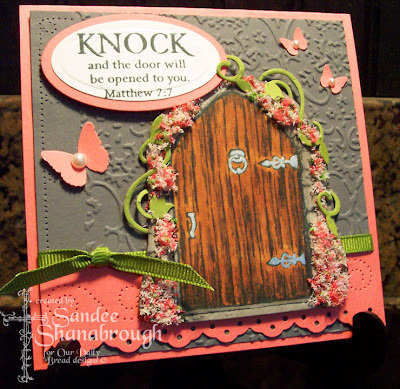 I used Stampin' Pastels to color on this card. I added the color with Q-tips and then sprayed regular hairspray to set the chalk. I then cut it out with Spellbinders Ovals. 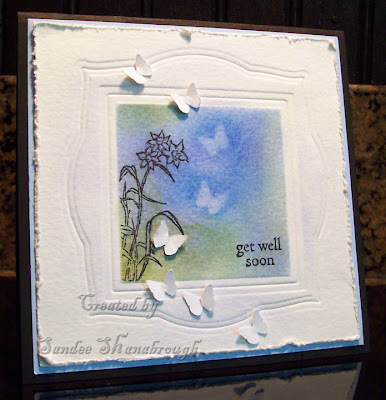 I used one of my favorite tools, the Cuttlebug, to emboss the background panel. Now did you know you can color your pretty little flowers and even ribbon with copics to get a perfect match? I had ribbon that was close to Cameo Coral but not quite there, so I used copic marker R22 to color it and the flowers and it matches so nicely with Cameo Coral! Then I added the pretty pearls to complete the card! I hope you have had a great day! Thanks for taking a look today! Accessories-Pastels, pearls, flowers, cuttlebug, embossing folder and corner die, Spellbinders, Nestabilities, ribbon, foam tape. 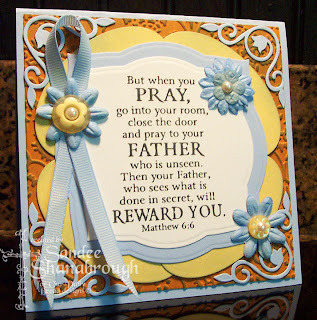 Here are a couple of cards I made for Our Daily Bread designs upcoming June releases! The two new sets are called Quiet Waters and Ask, Seek, Knock. For the first card I colored the image with copics (B21, B34, B93, BG10, BG72, E31, E33, E37, G21, W5, YG63, YG67). I then added some highlights on the water and trees with a white gel pen. I cut the image scene and mat with Spellbinders Labels Four nestabilities and sponged the edges with Sage Shadow ink. I added butterflies, bow, and pearls to finish it! For this one, I again used my copics(W5, E29, E31, E37). Just love to color with these markers! I colored the hinges and door knocker with a silver metallic pen. I added the cross by punching holes and sewing it on with silver thread. I used a negative punched piece to add to the bottom left corner. Added ribbon and silver cord. When I finished, the cross looked gold to me instead of silver so I painted it with the metallic pen! Thanks for stopping by today! I appreciate it so much! Hi everyone! Welcome to my first post on my brand new blog! I am so excited! 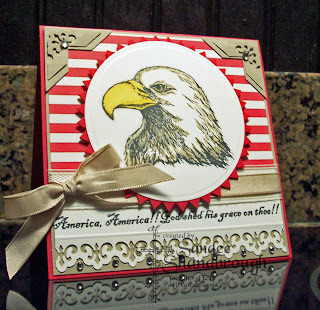 The first card I want to show you today is in honor of all of the soldiers who have helped to keep our country safe and free! I know I am so grateful for their sacrifices. 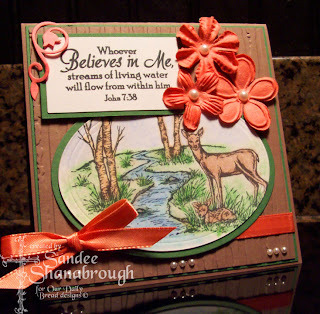 I used a stamp set from Our Daily Bread designs called In God We Trust. This majestic eagle is colored with copic markers (C1, Y17, Y28). I cut the image out with Spellbinders Nestabilities dies (standard large circle and Pinking small circle). I used a border punch at the bottom and to do the top corners. 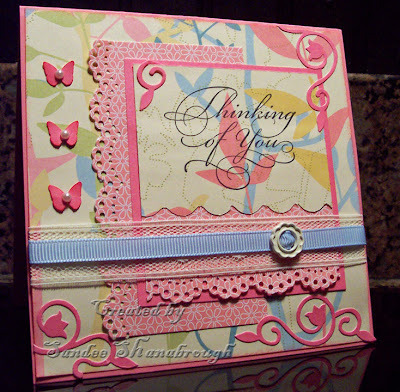 I scored a line above the border with my scor-pal, added lace, ribbon and rhinestones to complete the card. Enjoy your Memorial Day! Stay tuned! I'll be posting within a few days!